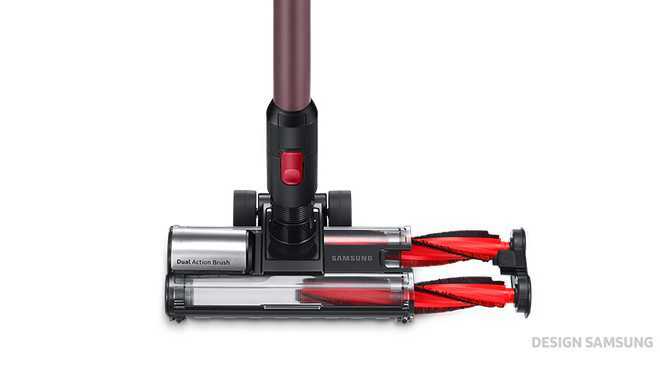 Samsung’s secret weapon: is this the Dyson killer? THE stick vac market is a big one for time-poor Aussies who want to get cleaning out of the way quickly and without using cumbersome machines. Often, they're cheaper, time saving appliances that can just get the job done. And in the same way that people used the brand name Hoover to describe vacuuming, in the last decade Dyson has arguably become the byword for all carpet and floor cleaning. But Samsung has something that could change all that. They're already in market in Australia with their POWERstick PRO. There's the entry level SS80N8015K2 ($699.00) and the more advanced SS80N8076KC ($799.00) which both boast 150w of suction power, and 40 mins of battery time. But you ain't seen nothing yet! The tech giant is releasing its POWERstick PRO 2.0 later this year and it really is the closest we've seen to a Dyson killer. They've ditched 300 grams off the weight of the appliance, boosted the battery time to 60 minutes and turbo-charged the motor to up to 200w of suction power. And it still features a HEPA filtration system that now captures 99.999% of fine dust and allergens. Mike Lilly, Head of Product Home Appliances at Samsung Australia said: "This is a powerful machine that will shave time off household tasks and give Aussies more time to do the things they love." I was able to get a hands-on look at the new POWERstick at Samsung's South East Asia and Oceania forum in Singapore last month, and it had more suction power and oomph than I've ever experienced in a vacuum. And I have two Dysons. It also has a telescopic handle which you can extend and retract and expand quickly and without interrupting the flow of your vacuuming. Prices have not yet been released for this new appliance, but for those in the market for a stick vac, I'd hold on until this one hits shelves - and carpets - later this year. And for those of you sick of hauling a heavy vacuum around the house, this stick vac could be the key to putting a spring back into your cleaning step. But if you really can't face vacuuming your home, then the new Samsung POWERbot might be more your style. Mike Lilly explains: "We want everyone to own more than one vacuum cleaner at home - robotic for convenience, stick vac for spot cleaning and a deep clean with the canister." Building on the existing technology and reputation Samsung has in market with their robot vac, Samsung has reconfigured their newer models to offer a powerful and intelligent cleaning performance- still with 20x more suction power up to 70x more suction power than other robot vacs, depending on how much cash you're willing to part with. These machines can 'accurately map an optimal cleaning path with visionary mapping 2.0' - with sensors on the top and bottom of the device to ensure the optimal path and cleaning experience. So there's nothing to do but put your feet up while your POWERbot does all the hard work for you.